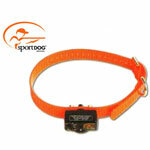 The SportDOG NoBark 6 is the easiest to use bark stopper ever invented. Just turn the battery to the on position and put it on your dog. Hear the quiet? SportDOG Brand. Gear the way you'd design it. Eliminate excessive, annoying barking with this lightweight, highly adjustable collar that is the easiest-to-use bark collar you can find.